Whether you're transitioning from another church management system, or brand new to a church management system like ChurchSuite, it may be helpful for you to understand some of the key terminology that's used throughout the platform. This same terminology is also used in our support articles and will be used by the ChurchSuite team in response to support tickets and questions. 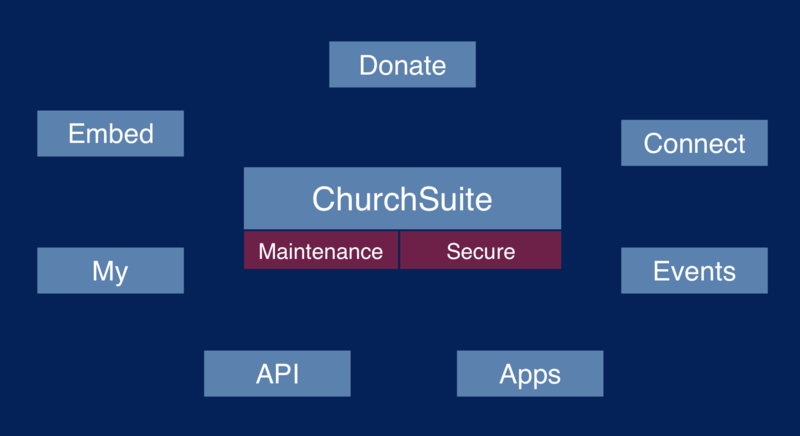 ChurchSuite is your admin-facing system (database) - the blue-bannered system with your modules across the top of the page. Your ChurchSuite system is only accessible to users who have been granted permission to log in and manage/maintain your database. Typically this will be your staff/pastoral/ops/admin team and key volunteers and leaders who have responsibilities within your church. Users log in with their username and password. My ChurchSuite is the member-facing side of ChurchSuite accessible by your church members. Within this system, church members can log in securely (by invitation) and manage their own personal details, view and manage rotas, engage with your events and small groups and manage their own children's details. The functionality available is dependent on the modules that you have on your account, and your My ChurchSuite module settings. Access is to members, not users, and they will log in with their email address and password. Connect refers to ChurchSuite's Sunday service facing applications that you can optionally run at your weekend services. Connect includes the Child Check-in system, and also several applications that can be run from your Information Desk on a tablet or laptop, like the "My Details" form - a newcomer form for visiting families and individuals to submit their details directly into your ChurchSuite database, that automatically triggers notifications to key ministry leaders based on the areas of interest expressed on the form. Connect also includes Information Desk applications to enable people to view, and optionally, sign up for your events, small groups, or make an online donation. Embed refers to the ChurchSuite features that you can optionally embed into your church's website. Embed is easy to deploy, with minimal technical experience, and once embedded, the content on your website remains up to date as the data in the underlying ChurchSuite modules change, rather than creating the information in two places. You can easily embed your church's events calendar, a 'featured events' feed, small group lists and maps, the online giving form, and a newcomer connect form. Donate is ChurchSuite's online donations platform. You can easy make Donate available to your givers through your website, at your information desk, embedded as a link within your communications and it can be accessed through the member-facing My ChurchSuite. Apps ChurchSuite and My ChurchSuite can be access through any web browser and also with our iOS or Android 'apps', which are available free from the respective apps stores. Apps are fully-functional (not scaled down versions of the browser-based system). Our apps allow users to have both their admin-facing and member-facing accounts in the one app, making it really easy to switch between the two accounts. A separate Connect app is available Android devices - ideal for wireless child check-in or for use by your welcome teams at your church's information point. API is freely available to churches who wish to make use of our web developer access in order to build your own front-end applications using the underlying ChurchSuite data. API is available to "full suite" customers who have all ChurchSuite modules. ChurchSuite also has open JSON feeds. Events management is a key feature of the Calendar module, with functionality available for everything from event invitations, ticketing (including secure payment handling), event sign-up and event check-in. Whether your event has an internal-only, member-facing or public-facing audience, the events platform manages all your event-related processes. Contact refers to an adult person in your Address Book module. Child refers to an under 18 child or young person in your Children module. Giver refers to a person that has a giver profile in the Giving module. Givers can be linked through to their underlying Address Book contact profile (meaning you only need to record contact details in the Address Book), or you can maintain them as unlinked givers (perhaps those donors who are outside your church, or those just visiting) and optionally record their contact details against the unlinked giver's profile. In this way, giver profiles can be kept distinct and confidential by restricting access to the Giving module. User refers to a person who has been granted access to your admin-facing system and has 'use' or 'manage' or 'administrator' permission to access the various modules. The system includes the ability to group users together into User Groups. One use of this feature is the ability to restrict the visibility of certain features to user groups - only users part of the group will be able to see or use that feature. Members refer to those who belong to or are part of your church, your congregation, those you are touching and tracking, those who are engaged with your church and have submitted some of their contact details for you to process on your system. And members can of course also include, but not limited to, any official membership your church maintains, including an electoral roll (Anglican churches). Small groups typically refers to your church's mid-week discipleship groups, and they are managed in the Small Groups module (all ChurchSuite modules can be renamed to suit your internal terminology). You might call them life groups, connect/community groups, hubs, pastorates, cell/growth groups, house/home groups. These groups will likely meet with various frequencies on various dates and in various venues. The group focus may be everything from intentional discipleship to outreach to a fun focus. You may (or may not) record attendance for these groups. Roles can be optionally assigned to group members, such as "Leader" or "Host". Both adult contacts and children can be assigned to these groups. Children groups refer to the children and youth groups that your church runs, typically at your weekend services, but may also include your mid-week children and youth groups, and children groups like "mums and toddler". These groups exist in the Children module (not the Small Groups module). You can record attendance for children groups (either producing printed registers for manual check-in/out, or using the module's Child Check-in system). Children are usually assigned to these groups based on their age and will normally be processed through your various children groups as they get older or in line with a change of school year. Children groups provide a means for managing your regular children and visiting families/children using the check-in system. Tags are a simple way to create custom groupings of people in your database that don't naturally fit into the designated "groups" functionality found elsewhere in the Small Groups and Children modules, as described above. For example, you could create a Tag to custom-group together all your "Member" contacts, or all your givers who gave to the last stewardship campaign, or all the children who went to summer camp. Once tagged, it's then really easy to bulk-communicate with those people. Tags can also be used to filter ChurchSuite reports in order to see the results for just a particular subset of your database. Within ChurchSuite there are two types of tags - fixed tags and smart tags. Key Dates are a feature of the Address Book and Children modules, ideal for recording significant date-related milestones, anniversaries and date events against people. These key dates might typically represent people's journey and engagement with your church activities e.g. the date someone first connects with your church, the date they attend a significant event or course, the date they complete some training. In addition to the key dates your user add against people, ChurchSuite also adds certain Key Dates, such as when a person joins or leaves a serving ministry or small group. Using Key Dates, it's very easy to visualise and report on people's engagement with the life and activity of your community. Flows are a feature of the Address Book module and enable churches to easily track and manage people through your recurring admin tasks, for example, newcomer integration. Using Flows allows you to keep track of who is at what stage of your processes, the tasks that are due/overdue, and what needs to happen with them next. Users can receive reminder notifications when tasks become due, making it really easy to care for people consistently, without people falling through cracks in your processes. Flows can be used for a wide variety of processes and workflows, e.g. DBS/safeguarding checks, managing discipleship applications, recruitment and training, membership processes, helping people get into small groups, to name but a few. Ministries exist within the Rotas module and refer to your various areas of serving and volunteering in your church, including Sunday ministries and mid-week ministries. Overseers can be assigned to ministries. Ministries can be organised into teams, with roles optionally assigned to ministry members to. And of course rotas can be produced for each ministry, with automatic, timely serving reminders sent to rota members. Beginning with the Address Book, and working through each module your church has subscribed to, go into the module options (the cog wheels in the top right-hand corner) and customise ChurchSuite to suit your church's needs - perhaps enabling or disable features, adding custom fields or enabling optional fields. If you're a multi-site church you'll need to add each of your sites. If you were working with test data during your trial, you may want to clear down that data and import clean data. This support article explains how to import your data. And this support article explains how to delete existing contacts. You may also want to set up your church's custom fields prior to import. We recommend you import adult and children separately into the respective Address Book and Children modules, and then complete the spouse/partner and parent/child linking after import. Multi-site churches can either specify the site in their data to be imported, or you can import people into each site, one site at a time. Each module's reports section includes several data cleansing tools to help you identify potential duplicates and missing data. Data cleansing and linking potential couples. Linking children to parents. Upload your church's branding and artwork e.g. logos, colour schemes etc. See this support article for further information. Check your account, billing and data protection contact details are up to date. Check that you ChurchSuite subscription payment has been set up. Add users to your ChurchSuite account giving appropriate permissions to each. See support article - there's no maximum number of users. Set up any User Groups and add users to those groups. See support article. E.g. Stripe (for receiving card payments for event ticket payments and donations), GoCardless (for direct debit donations), Podcast, SMS integrations and permissions (e.g. TextLocal, Twilio, BulkSMS). You can change the default module names to use language that is familiar to your church. So if you call small groups "Cell Groups", here's how. Set-up your group structure - what we call a "gathering" and the various groups in each gathering, and then assign children to their groups. Gatherings, Groups and Sessions, Add children to groups. Including roles, clusters, visibility in My ChurchSuite and Embed, inc group sign-up settings. Add people to your small groups. Set up your Calendar module: calendar event categories. You can then begin to add events to your calendar. Assign people to ministries, create teams, add people to teams, publish rotas. Set up Preset communications: emails or SMSs. Explore Tags and Key Dates: Set up any Fixed tags, Smart tags, Flows, and Key Dates your church may want to begin with. Funds, online giving (optional), giver profiles, Gift Aid settings (UK only), Gift Aid declarations (UK only), pledges. Set up the Bookings module: Set up your various booking Types and your Resources. Note: For each support article referenced above, we also draw your attention to the related articles shown at the bottom of each article - these provide further detail about related functionality and similar related topics. Help is always available through the "Ask a Question" support beacon in the bottom right-hand corner of every page in ChurchSuite - search by topic, phrase or keyword. Do people know what personal information is being stored/processed by the church and the purpose for which it is used? For each type of information being processed, do we have a lawful basis for processing and is our privacy notice up to date? Do people understand that only appropriate users have access to data, the security protections in place and their permissions? Does your data retention policy need updating? Have we purged all data that we no longer have a lawful basis to process? Do we need to refresh our training, confidentiality and data access provisions for staff and other users? Are default privacy settings and communication options appropriate and in line with current legislation and the expectations of church members? Do the church's "data capture" processes (e.g. visitor cards, web embedded forms etc) have sufficient data protection disclaimers and privacy notice visibility? Does our safeguarding policy need updating to reflect how data will be handled in respect of children and vulnerable adults?